Over the winter break, my son and I worked to finish his fourth and largest quilt. He began work on it this past summer and it was quilted in November. My final finish of 2017 was to help him finish it up on New Year's Eve. G designed the quilt to be a twin-sized bed quilt for his sister. All of his fabrics were chosen by him from my stash. I think we all especially love the teal turtle fabric. 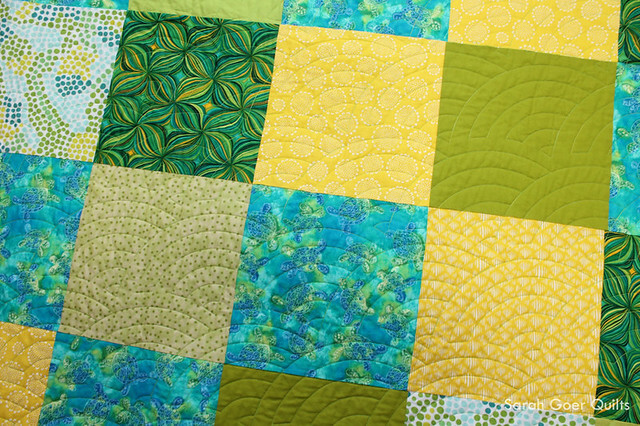 I love his combination of colors and fabrics, especially the addition of that bold green and yellow print. He made the design decision for that print and the turtle print to not ever be right next to each other. 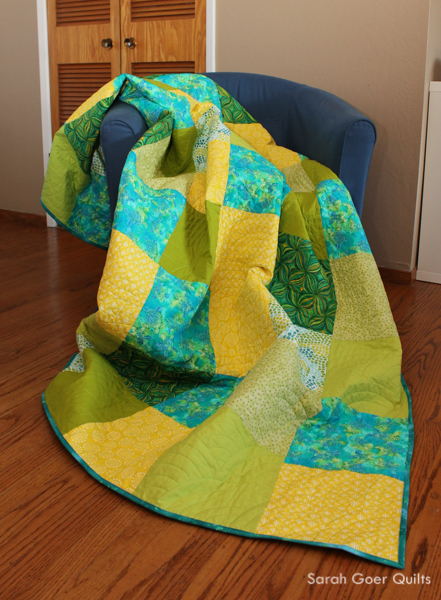 We sent it out to a local long arm quilter (Tami Levin). G chose the Baptist Fan quilting motif. I really like the curved quilting. It adds a great dimension to the quilt. The lines of stitching are about an inch apart. Here's the full view of this cheerful 67" x 85" quilt. My daughter is now happily sleeping under it in her ocean room. My son has decided since he's made himself a quilt, two for his sister (including this one), and one for his dad, it is now time to make me a quilt. We discussed his plans at our one-on-one dinner this week and he would like it to be purple and grey, twin-sized so it's large enough for me to cuddle up with, and he'd like glow in the dark purple paint on it. I'm intrigued by his vision and look forward to seeing what he creates next. I'm liking up to Needle and Thread Thursday, TGIFF and Finish It Up Friday. I'm also linking up to the Q4 Finishes Link-Up. 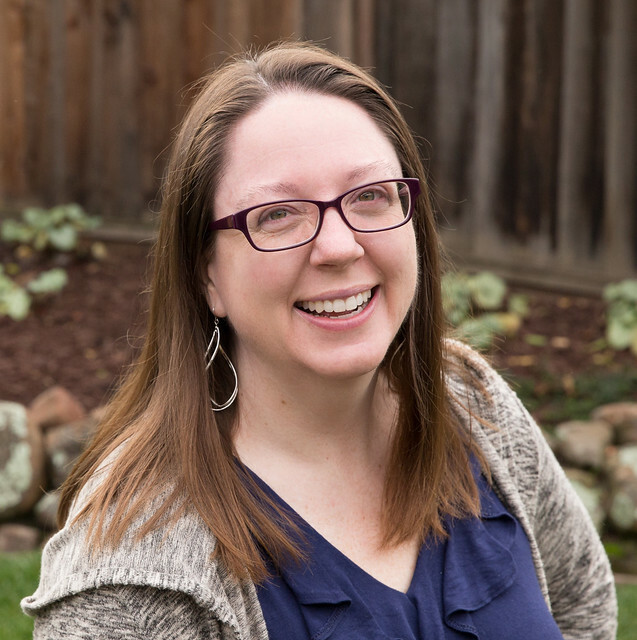 See my Q4 list here. My blog's third anniversary is later this month. To celebrate, I'm making some changes to the blog, including the addition of a twice monthly newsletter! Click below to stay in touch and receive color and design inspiration direct to your inbox! Posted in Quilting. 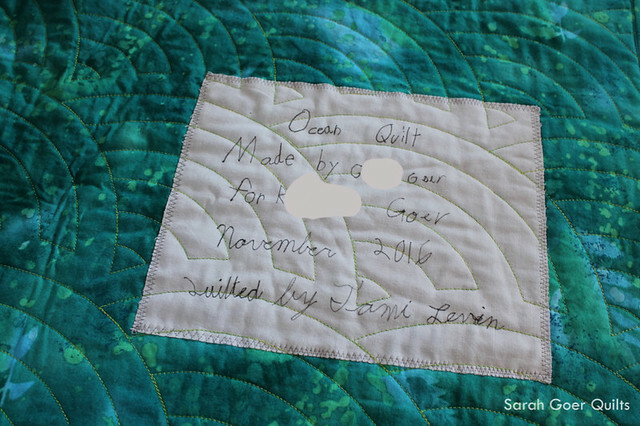 Tags: finished quilt, Ocean Quilt, quilting with kids, twin quilt on January 6, 2017 by sarah. What a generous heart your son is cultivating through quilting, which is honestly one of my favorite parts of being a quilter (and my secret wish for the planet is that we *all* become quilters)! 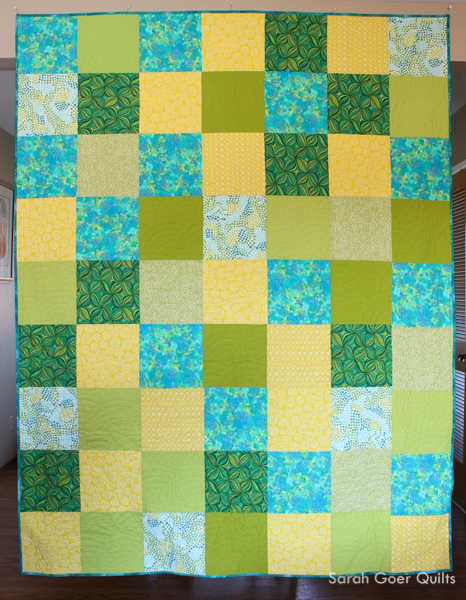 I love that turtle print and have used it myself in many quilts (but I think I might have used it all up by now). 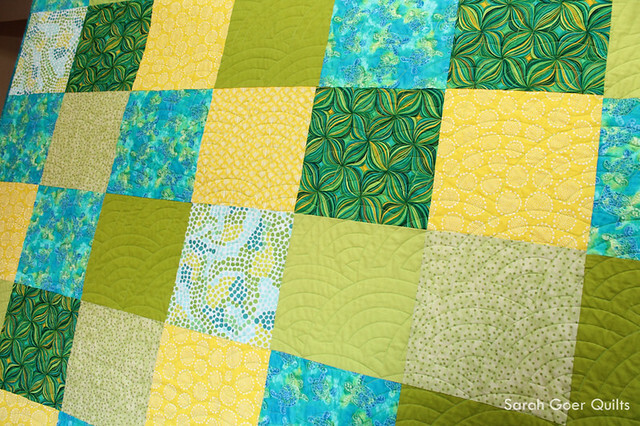 I am also intrigued by his vision for your quilt with the glow in the dark paint and look forward to seeing how his design evolves into fabric and reality. Clearly he knows you well and I think the purple will be nicely balanced by his choice of gray. He is so sweet. It's nice to see him sharing my passion and thinking of others. I'll keep ya posted on his purple and grey project. Thanks for visiting, Yvonne! What a great job he did! I'm also very impressed by his handwriting! Thank you, Kat. I'll pass along your message. I love it. Also can't wait to see what he will create next. Thank you, Cathy. I'm looking forward to it as well. I think it is so so lovely that your son and yourself quilt together. My sons and I used to flower arrange and bake when they were small. They are treasured times and his quilts will last unlike our flowers! Thank you, Helen. I hope he continues sewing and quilting. It's something that really brings me a lot of joy. We've always known what a great kid G is, and I'm so thrilled to see the results of his work. Gorgeous job! Very proud of him! I love his ocean quilt! 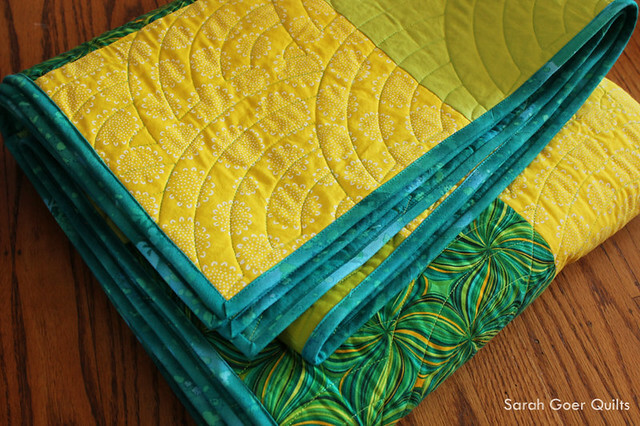 What a great combination of fabrics and the baptist fan quilting really was a great choice. Glow in the dark paint...that should be an interesting addition to your quilt :) I look forward to seeing what he comes up with! It's wonderful! Well done, G! Congratulations on the finish, and thank you for participating in the 2016 Finish-Along, from all the hosts! Thank you so much! I'll pass on your congratulations to him. I really appreciate your work to host the Finish Along! It's beautiful. He did a wonderful job. Compliments to him. Looking forward to seeing your quilt with glow in the dark paint.